“The food at your wedding doesn’t have to be great. Guests won’t remember what they ate.” That’s what one well-meaning person told me as I was picking a venue for my 2005 wedding. My response? “But they’ll remember if the food was bad.” And from that conclusion, I was determined to find a fantastic venue with great food that fit our budget. I lucked out, too, when I came across the Hotel Monaco in D.C.’s then-up-and-coming Penn Quarter neighborhood. Restaurants in the chain of one-of-a-kind Kimpton Hotels are generally known for excellent food. Having dined at the hotel restaurant, Poste, during Robert Weland’s tenure as chef, I knew that my guests and I would enjoy a fantastic spread. 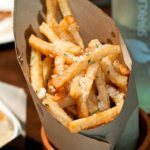 Truffle frites: Imagine a hot crispy French fry that melts in your mouth the moment it hits your tongue. Absolutely delectable. If it was socially and nutritionally acceptable, I would’ve ordered my own personal helping and eaten the whole thing. 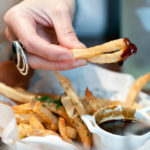 Bordelaise frites: The first word that sprung into my mind when I dipped a fry into the Bordelaise sauce was “meaty.” Made with marrow, wine and seasoning, it’s a classical French preparation and – for me – an unusual treat. 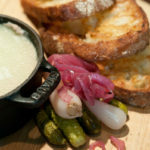 Pork rillettes: Served with crispy grilled bread and housemade pickled vegetables, I enjoyed the accompaniments more than the pâté-style spread. Like every dish at Poste, the unique plating is so appealing, you just want to dig right in. 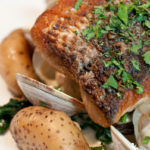 Rockfish: I chose a regional favorite, rockfish – aka striped bass, as my entrée. The medium-textured fish had a delightful crust on top. The clams around the dish weren’t just visually striking, but tasty as well, and the bacon-braised potatoes possessed just the right hint of bacon flavor. 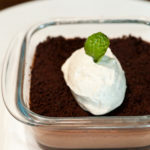 Chocolate Pot de Crème: As the name denotes, it’s a silky and chocolaty custard topped with a chocolate crumble and (more!) cream. This is a dessert you must not miss. Chocolate-Mint Torte: File under “Try Something New, You Might Like It.” The only way I usually enjoy mint is in a piece of chewing gum. 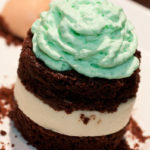 But when I tasted both spearmint and peppermint in the torte, I was pleasantly surprised and enjoyed a few bites. 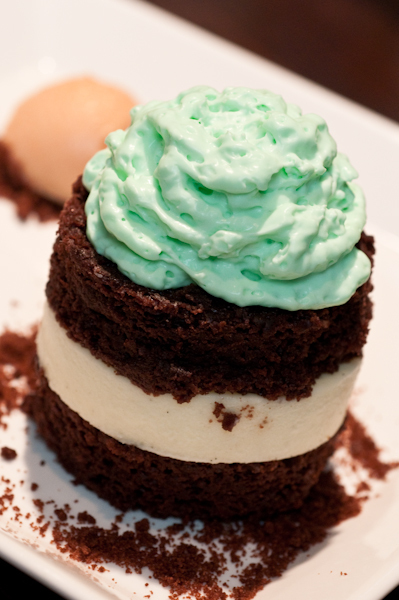 With the moist chocolate cake and blood orange crème fraiche ice cream, this is a great dessert for someone who loves mint. Chef Marron was kind enough to send me home with a cinnamon-y apple butter, which I’ve been enjoying with homemade challah. DISCLOSURE: I was treated to this amazing lunch by the fine folks with Kimpton Hotels & Restaurants. Have you eaten at Poste lately? What’s your favorite dish? Welcome to 2012 – New Year, New Goals!